The Calgary Flames had high hopes for the 2017-18 season after loading up the prior summer with high-price talent. Unfortunately their season disappointed, and that disappointment has led to another busy summer for general manager Brad Treliving. Expectations remain sky-high in southern Alberta, but the margin for error has become quite thin for the current management group. After some shaky defensive play throughout last season and some inconsistent goaltending down the stretch, the Flames will need more from their back end group to succeed in 2018-19. Here’s our projections for how the Flames roster shakes out in the crease and on the blueline heading into training camp. 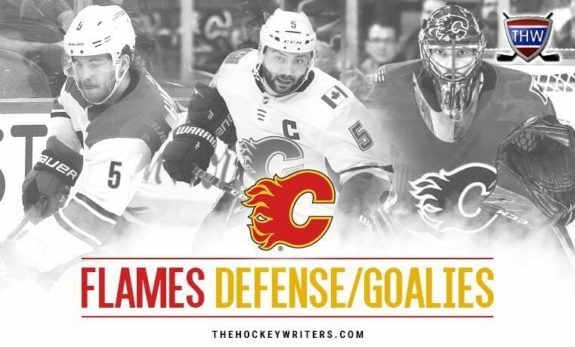 The 2018-19 Flames will arguably be made or broken by their goaltenders, much as they were throughout the prior season. The 2017-18 Flames were initially held together through some very shaky early performances by a series of stellar efforts by a 35-year-old Mike Smith. But Smith suffered a low-body injury on February 11 and ended up missing a month of action. With rookies David Rittich and Jon Gillies splitting starting duties the Flames went 5-10-2, and Smith looked all-too-human upon his return to the crease in mid-March. 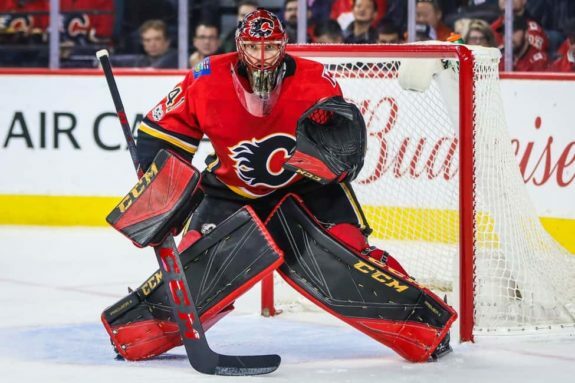 After his superb netminding in the first two-thirds of last season Smith is a lock to return as Flames starter – though his status beyond this season may be in question due to his age, as he turns 37 in March. But the surprise regarding the Flames’ netminding is how few changes they’ve made to their personnel. After the Eddie Lack as backup experiment fizzled out early last season – resulting in Smith playing a ton of early games – Rittich settled into a nice groove as backup, primarily playing the second game of back-to-back road trips. While he seemed to crack under the pressure of being an NHL starter while Smith was injured, his age, waivers status and developmental maturity make him an ideal backup. The challenge for goaltending coach Jordan Sigalet and new head coach Bill Peters may be tapping Rittich early and often enough in the season that he develops a starting routine in net in the event Smith suffers another injury. Behind Smith and Rittich, Gillies will likely begin the season as the starter for the American Hockey League’s Stockton Heat – Rittich’s waiver status and the chance to keep Gillies playing and developing in Stockton are the primary reasons for this preference. That said, keep an eye on Gillies’ performances in the AHL. With a higher developmental ceiling than Rittich, he could press for time in the NHL net with a strong start to the AHL calendar. The medium-term goal for the Flames is to keep bringing Tyler Parsons, the incumbent AHL backup, along in his development, and expanding his workload this season would go a long way to doing so. If Gillies can make a case for time in a Flames sweater, Rittich may end up being the odd man out. The big challenge for the Flames last season was TJ Brodie’s lack of chemistry with Travis Hamonic, particularly in terms of communication and positioning in their own end early in the season. While Mark Giordano and Dougie Hamilton were superb in the offensive zone, they faced challenges on the defensive end – primarily in Hamilton’s side of the rink. But the top four didn’t deliver the consistency that Treliving had hoped they would, so changes were mid over the summer. 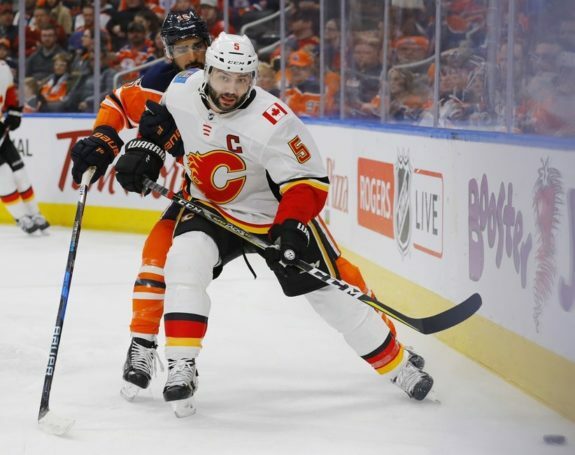 Brodie returns to a familiar spot: the right side of Giordano, where he spent the better part of three seasons and played the best hockey of his career. He’s replaced on the second pairing by Noah Hanifin, acquired from Carolina in the Dougie Hamilton trade. The challenge for the Flames and their coaching staff is now to help Brodie recapture his magic with Giordano and assist Hanifin in gelling with Travis Hamonic. As has been the goal with the last few defensive tinkers made by Treliving – the trades for Hamilton, Hamonic and now Hanifin – the hope is that they’ll alleviate the drop-off between the Giordano pairing and everybody else. The biggest spot for potential improvement for the blueline over last season is on the third pairing. Last season’s third duo of Brett Kulak and Michael Stone (with occasional appearances by Matt Bartkowski) were fine, but they didn’t factor into helping the Flames win games very often. 2017 first round selection Juuso Valimaki is a high-impact defenseman who starred with the Western Hockey League’s Tri-City Americans and captained the Finnish entry at the World Juniors last winter. He’s mature, composed and highly skilled. He’ll be given every chance to prove that he’ll be an improvement over Kulak – who would likely become the seventh defender if he’s supplanted due to his waiver status. Behind Kulak and Valimaki are AHL standouts Rasmus Andersson, Oliver Kylington and veteran Dalton Prout knocking on the door. Prout would be fine as a seventh man in the NHL, but he would also be a good mentor for youngsters in Stockton. If given a choice between waiving him or Kulak, Kulak’s youth and versatility probably keeps him in the big leagues. The Flames are hoping to be a harder team to play against in 2018-19, but rather than employ more big bodies on the back end it seems more prudent for them to load up with youth, speed and skill wherever they can.